A couple of weeks ago, in the brief throes of a fit of domesticity after spending too much time looking at pictures on Martha Stewart’s website, I took the kids to a local farm and purchased a five-pound bag of Gravensteins grown in the farm’s orchard. We then went home to make a delicious apple pie. While I was double-checking the ingredients we would need — other than apples, of course — I happened upon a recipe for Chemical Apple Pie. This chemical pie was supposed to taste just like apple pie without containing any actual apples. You know, because who really wants to put apples in an apple pie? The recipe was posted by John Pile, who wrote, “This is an old chemistry lab experiment to teach the limits of human senses.” I had to try it. And trust me, you do, too. For the freakiness factor, if nothing else. One package of two frozen ready-made pie crusts, one for the top of our pie, and one for the bottom. I always use Tenderflake. Or you can go crazy and make your own pastry. First! Preheat the oven to 450 degrees. Take the two pie crusts out of the box and set them aside. Bring water to a boil in a large saucepan. This is so easy you could practically get your 6-year-old son to do it while you watch Youtube videos of starfish crawling along the sea floor. Not that you should, mind you! Those starfish are mesmerizing and hence a real time waster! Also, children should never use the stove unattended. Then! Mix the sugar and cream of tartar, whatever the hell it is, together and add this to boiling water. Stir. Sniff delicately because at this point, if your nose is good, you may detact a faint apple-ish scent. Then add the Ritz crackers. 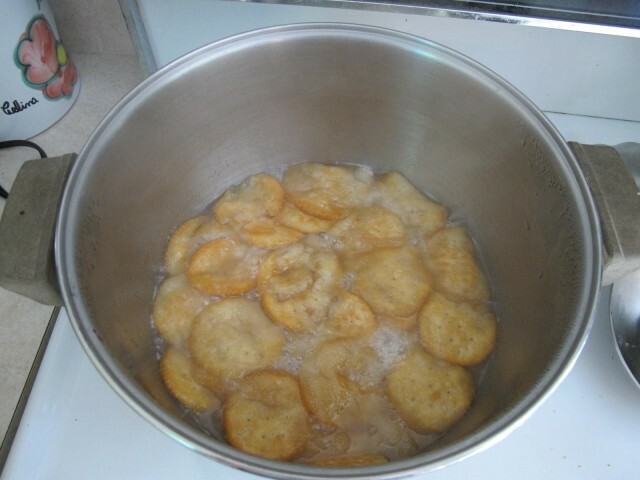 Boil for 3 minutes, resisting the overwhelming urge to stir them and break up all the lumps. You will need the lumps later, when you want people think they are chunks of cooked apple. Next! Pour this strange mixture into the bottom pie shell in its tinfoil pie pan. Sprinkle the cinnamon all over the top and then cover the whole things with small dabs of butter. Remove the second ready-made pie crust from its tinfoil pan and place it over the top. Seal the edges of the two crusts together with your thumbs and and use a knife to cut steam vents in top. If you want to get really fancy, you can cut the top pie crust into strips and make a lattice top instead. If you do this well, it might make the pie look more impressive and help to fool the unsuspecting people to whom you are going to serve it. But be forewarned: this requires rudimentary weaving skills and a deft hand with uncooked pastry. I possess neither. Finally! 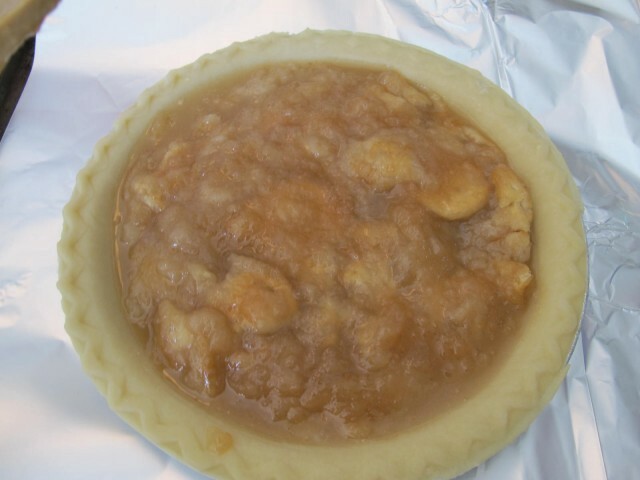 Bake the pie in the preheated oven for 30 minutes, until the crust is golden. 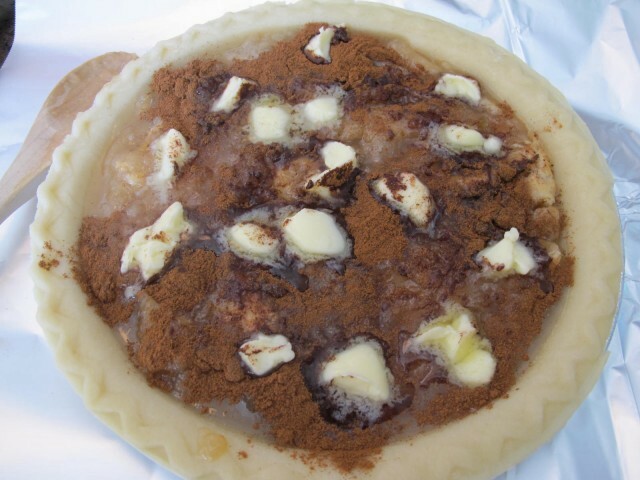 You may need to cover the top of of the pie partway through baking to prevent it from burning. Me: Do you smell apple pie? Husband: I smell something. I don’t know what it is. It might be apple pie. Or bbq. You know the way my nose is. At this point, I didn’t expect the experiment to end well. I expected the pie to taste terrible (or maybe like chicken). I’m slightly disappointed to report that I was wrong. Chemical apple pie tastes very much like apple pie, except it’s perhaps a bit too sweet. If you use really good apples in a real apple pie, you get a lovely tart flavor that was not replicated in this recipe. However, everyone in this house who tasted this pie thought it tasted just like an ordinary apple pie. Including me. In fact my husband, who was not informed about this experiment ahead of time as the six-year-olds and I were, took one bite and exclaimed, “Wow, that is one good apple pie!” He has been living with me for many years and hence his standards are low. Personally, I wouldn’t say it was good apple pie — I would just say that, if I didn’t know otherwise, I would believe that it was indeed an apple pie. And the six year olds, who knew the pie did not contain any apples and yet felt strongly that it tasted like apples, are now deeply confused. • You hate apples but love apple pie. • If there was a worldwide apple shortage. • You’re unable, or unwilling, to get into the car and drive over to the farm stand/grocery store to purchase apples. • The person for whom you’re making the apple pie is deathly allergic to apples. • You’re concerned about the pesticides on apples but not about all the crap in processed foods. • You can afford to buy a box of Ritz crackers but not a bag of apples. • You feel that, at this point, chemicals are actually more American than apples. So how does the pie work? What the hell is cream of tartar, and why does it taste like apples when mixed with sugar and hot water? And who invented this recipe? Were they looking to make fake apple pie or was it just a happy accident? Okay, let’s start with the cream of tartar. Wikipedia tells us that its proper scientific name is ‘potassium bitartrate’ and that it’s a salt derivative of tartaric acid. It’s commonly produced when making wine. Note: tartaric acid is a muscle toxin but can be safely added to foods in small quantities. You’d have to ingest approximately 18 oz to die. (Clearly the person who wrote this Wikipedia entry has underestimated my penchant for pie.) 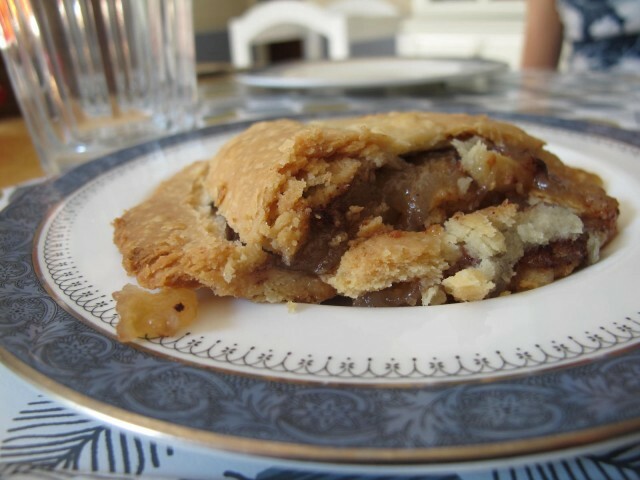 Meanwhile, an entry about Mock Apple Pie (the name rings a bell, doesn’t it?) over here tells us that apples contain both tartaric and malic acid and suggests this is why cream of tartar mixed with sugar tastes so apple-y. The AllRecipe.com poster’s assertion that the recipe is widely used as a science experiment with school children is true — among other educational sites of varying respectability, the recipe is also provided on the San Francisco Exploratorium’s site. At the Exploratorium, they wisely recommend the addition of lemon zest and juice, presumably to make the pie a little tarter. They also claim it was often made during WWII, when apples were in short supply and therefore prohibitively expensive. Further searching revealed that it is an even older recipe than that, dating back at least to the mid 1800s. 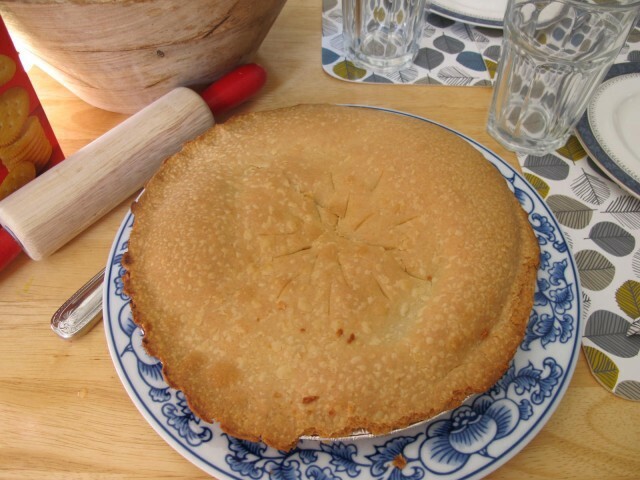 Recipes for it have been found in the Confederate Receipt Book in 1863 and Mrs. B. C. Whiting’s How We Cook In Los Angeles (1894) in which she referred to it as “California Pioneer Apple Pie, 1852” (if you follow that link, choose Mock Apple Pie from the menu on left). It’s certainly easy to imagine that, historically, apples were difficult to come by out of season, at the end of a long journey across the prairies, or in an poorly supplied army camp. (As Mrs. Whiting is quoted saying, “The deception was most complete and readily accepted. Apples at this early date were a dollar a pound, and we young people all craved a piece of Mother’s apple pie to appease our homesick feelings.”) Presumably crackers — or the cracker-like foods of the time — kept better, and one sometimes needed to dream up new, more interesting ways to force oneself to ingest them yet again. Apparently, the Nabisco company appropriated the recipe in the 1935 when they printed it on the boxes of their fancy new Ritz crackers; today, most people who are familiar with Mock Apple Pie associate it with Ritz. You can still find the recipe on their site, where they warn you to watch your serving size. Probably because of the calorie and fat content, not the muscle toxin. As for the culinary genius who originally invented this recipe, the Internet and I are at a total loss. Next week: Mock Turtle Soup! If I can get my hands on a mock turtle. Maybe that will taste like chicken. Stephany Aulenback lives in Nova Scotia with her husband and two children. She blogs at Crooked House.